St. Michaels 1-12, Dunsany 1-3. Saturday October 22nd 1994 in Martry. St. Michaels Ladies proved to be the more fitter and determined team in this entertaining final played in very wet conditions in Martry on Saturday evening last. The winners racked up a commanding 1-6 to 0-2 half time lead after Lisa McDonnell goaled at the end of the opening quarter. Points from Carol O’Connell 0-3, Sharon Lynch 0-2 and Lorraine Flanagan 0-1 completed the first half scoring for St. Michaels. Dunsany added their goal 10 minutes into the second period but further points from O’Connell, Lynch and McDonnell secured the title for St. Michaels. This was a great overall team performance for St. Michaels who had excellent performers in Eilish Fitzsimons, Elaine Lynch, Orla McCabe, Sharon Lynch, Mandy Carr and Carol O’Connell. Eilish Fitzsimons, Elaine Lynch, Orla McCabe, Catherine McPhillips, Donna Lynch, Lisa Keenan, Sylvia Carolan, Sharon Lynch 0-5, Mandy Carr, Lorraine Flanagan 0-1, Nicola Carolan, Carol O’Connell 0-5, Deirdre Daly, Carol Sheridan, Lisa McDonnell 1-1. Phyllis Carolan, Kate Smith, Wendy Flood, Ruth Bowler, Sinéad Crosby, Sharon Mooney, Helen Brannigan, Laura Smith. St. Michaels / Wolfe Tones 0-14, St. Cuthberts 0-7. The St. Michaels / Wolfe Tones combination reversed an earlier result in the MFL division 2 with this play-off victory in Kells last Friday evening. Derek Meehan, Keith McLoughlin, Donal Keenan, Daithí Regan and Daithí Reilly impressed for the winners who led by 0-7 to 0-5 at the break. St. Michaels / Wolfe Tones will now meet St. Patricks in the second semi-final. D. Meehan, G. McKeever, David O’Brien, B. Molloy, S. Farrelly, K. McLoughlin, G. Leonard 0-1, Donal Keenan, Sean Gaffney, N. Carolan 0-1, M. McGarry 0-2, Daithí Regan 0-7, T. McKeever 0-1, Daithí Reilly 0-2, J. Lynch. St. Michaels / Wolfe Tones 0-14, St. Patrick’s 2-7. St. Michaels / Wolfe Tones qualified for the MFL division 2 final with this minimum margin victory over St. Patrick’s in last Friday’s semi-final in Walterstown. The combined side staged a great comeback to take the spoils. Pat’s led by 1-4 to 0-3 at the break and had increased their lead to eight points with 15 minutes remaining. But then, with Dáithi Regan sending over some fine points, St. Michaels / Wolfe Tones battled back to steal victory. Regan sent over nine points and David O’Brien, Gerry McKeever, Sean Gaffney, Sean Farrelly, Michael McGarry, and Daithí Reilly were others to impress for the winners. D. Meehan, G. McKeever, David O’Brien, B. Molloy, S. Farrelly, K. McLoughlin, G. Leonard, Donal Keenan, Sean Gaffney, N. Carolan, M. McGarry 0-3, Daithí Regan 0-9, T. McKeever 0-1, Daithí Reilly 0-1, J. Lynch. The MFL Division 2 final between Oldcastle and St. Michaels / Wolfe Tones is down for decision at Pairc Tailteann on Saturday. These two sides drew in Carlanstown earlier in the competition. Oldcastle beat St. Ciaran’s in their semi-final. St. Michaels / Wolfe Tones came with a strong late run, snatching the fourth qualifying place in a three way play-off and then beating St. Pat’s in the second ‘semi’. Top scorer Daithí Regan, Keith McLoughlin, Michael McLoughlin, Michael McGarry and Donal Keenan have been prominent in the combined teams recovery. Meanwhile, Oldcastle have talented youngsters in Jerome Lynch, Ronan Crawley, Michael Briody and Diarmuid Fanning. St. Michaels / Wolfe Tones 3-6, Oldcastle 1-10. Friday August 26th 1994 in Pairc Tailteann. St. Michaels / Wolfe Tones certainly won the MFL Division 2 title the hard way. An outright triumph looked unlikely when they lost to St. Cuthberts at the beginning of August. But then they snatched the fourth semi-final place in a three-way play-off before coming from eight points down to beat St. Patrick’s at the penultimate hurdle. It was the other way around in last Friday evening’s final in Pairc Tailteann with St. Michaels / Wolfe Tones building up a decisive lead during the first half and then hanging on to take the spoils. It was a pity to see such an exciting and well contested match in rainy conditions spoiled by some breaches of the peace just before and immediately after the final whistle. The contest was well into added time when Summerhill referee Donal McKay ordered off Keith McLoughlin of the winners and Oldcastle’s Ronan Crawley. Another of the losing side could be facing the Minor Board as a result of a post match incident under the stand. Before the late drama ‘soft’ goals were the main talking points. Three of the four scores to the net were of the gift variety. The eventual winners benefitted twice in the first half when building up a 3-4 to 0-4 interval advantage. After nine minutes full forward Daithí Regan availed of slackness in the opposing defence to finish via the hands of Oldcastle full back Paul Smith. Thirteen minutes later it was the turn of Danny Growney to hand out a present which Trevor McKeever gratefully accepted. In between, Reilly caught a high dropping ball from Michael McGarry and blasted in a second goal. Oldcastle didn’t have the same good fortune in their goal attempts in the first half. Full forward Jerome Lynch had a couple of chances but his fisted efforts were saved by ‘keeper Derek Meehan, who played really well, and the second went wide. Michaels / Tones were quite strong down the middle with Keith McLoughlin, Sean Gaffney, Donal Keenan, McGarry and Reilly playing important roles and Daithí Regan maintaining his fine free taking form. Regan’s contribution was again crucial as his two pointed frees in the second half just kept his side ahead. With Lynch moved out to midfield, Oldcastle dominated the second half and would have gained at least a second chance with a little more sharpness in front of the posts. Overall they hit 11 wides compared to five for the winners. Oldcastle’s goal was a fluke with a mishit free by Diarmuid Fanning sliding through to the net. That left just four points 3-4 to 1-6 in it after 43 minutes. That deficit was halved with points from Michael Briody (free) and Lynch before Michaels / Tones got their first score of the second period on 22 minutes. Oldcastle depended too much on Briody’s frees for scores. The number 9 slotted over two more before Regan closed the scoring. D. Meehan, G. McKeever, David O’Brien, N. Carolan, S. Farrelly, K. McLoughlin, G. Leonard, Sean Gaffney, Donal Keenan, Daithí Regan 1-3, M. McGarry 0-2, M. Meehan, F. Fagan, Daithi Reilly 1-1, T. McKeever 1-0. K. Keogan, G. Briody, P. Smith, D. Growney, S. Colgan, R. Crawley, E. Sheridan, N. Fitzpatrick, M. Briody 0-6, R. Smith 0-1, C. Walsh, P. Garrigan, J. Lynch 0-3, D. Fanning 1-0. All photos by and the copyright of Pascal Reilly. Tuesday 22nd August 1995 in Oldcastle. St. Michaels 2-15, Oldcastle 2-7. St. Michaels booked a place in the division 2 F.L. final with this victory in Oldcastle last week. The home side led by 1-6 to 1-5 at the break but with Tommy Moriarty, Martin and Michael O’Connell, David and Nigel Regan who shared 1-13 between them, and Niall Gaffney impressing, Michaels had the better of the second half. Robert O’Connell, Kevin Lynch, Tom Halpin, Aidan McDonnell, Bernard O’Brien, Tommy Moriarty, David Moran, Michael O’Connell 0-1, Martin O’Connell 0-1, Dáithí Regan 1-6, Paul Curran, Dáithí Reilly, Niall Gaffney 1-0, Nigel Regan 0-7, Gabriel Curtis. Sunday 22nd October 1995 in Kells. St. Michaels 1-9, Castletown 0-9. There was a bizarre ending to the Division 2 FL final at Kells on Sunday as St. Michaels took the title for the second time and consigned Castletown to a second defeat in a decider in four weeks. Added time was being played when Castletown were given the opportunity to battle another day with full forward Tommy Monaghan being fouled for a penalty. Alan Smyth, who had come on and scored a penalty goal in the IFC final, started this time but was withdrawn shortly before the awarding of the penalty kick. But he was brought back on only to see his goal attempt go the wrong side of the right upright. Of course it was the right side for St. Michaels who probably just about deserved to take the Gaughran Cup and the Carlanstown side were thrilled about their triumph. The team in red and black were never headed after Bernard O’Brien shot their goal after 26 minutes following a pass from Nigel Regan. That left it 1-2 to 0-2 at the interval. The first half fare was rather mundane with Castletown guilty of some deplorable finishing. The intermediate finalists resumed with their inspiring coach Shane McEntee banished to outside the perimeter wall. Referee Jimmy Henry obviously did not take too kindly to some criticism by McEntee on the way off after the half time whistle. Castletown who showed 3 changes in personnel from their team four Sundays earlier, began to get a better percentage of shots on target in the second period. Liam Clarke, who struggled with frees before the break, knocked over a couple in the third quarter. But brothers Nigel and Daíthi Regan both got on the mark twice in that third quarter as Michaels took control. When Michael O’Connell shot over in the first minute of the last quarter his side was five points 1-7 to 0-5 to the good and looking good. Tom Halpin and captain Tommy Moriarty were strong in the middle of the Michaels defence where 39 year old veteran Gabriel Curtis was not giving away much either. Martin and Michael O’Connell contributed well at midfield with the Regan duo making most impact up front. Just like in the IFC final, Castletown refused to lie down after going five points in arrears and with six minutes to go they were back to within two points of the leaders after half back Tom Finn, Declan Young and Clarke shot over. Daíthi Regan steadied Michaels with a fine shot between the uprights from out on the left before Clarke slotted over his fifth point and fourth from a free. But it was Martin O’Connell who had the last say with the county hero lofting a long range free out of his hands over the bar before the late late drama became the main talking point of the match. Tommy Moriarty received the Gaughran Cup from County Board PRO Brendan Cummins. Robert O’Connell, Gabriel Curtis, Tom Halpin, Aidan McDonnell, Raymond Lynch, Tommy Moriarty David Moran, Michael O’Connell 0-1, Martin O’Connell 0-1, Dáithí Regan 0-3, Dáithí Reilly 0-1, Bernard O’Brien 1-0, Niall Gaffney 0-1, Nigel Regan 0-2, Derek Crosby. L. Bellew, T. McKeown, C. O’Reilly, G. Sheerin, T. Finn 0-1, D. Price, B. Sheerin, P. Condra, J. McConnell, A. Monaghan, D. Young 0-1, L. Clarke 0-5, A. Smyth 0-2, T. Monaghan, B. Carry 0-1. M. Donegan for Smyth, Smyth for T. Monaghan. Photo’s by and the copyright of Pascal Reilly. St. Michaels 4-6, Dunsany 3-8. 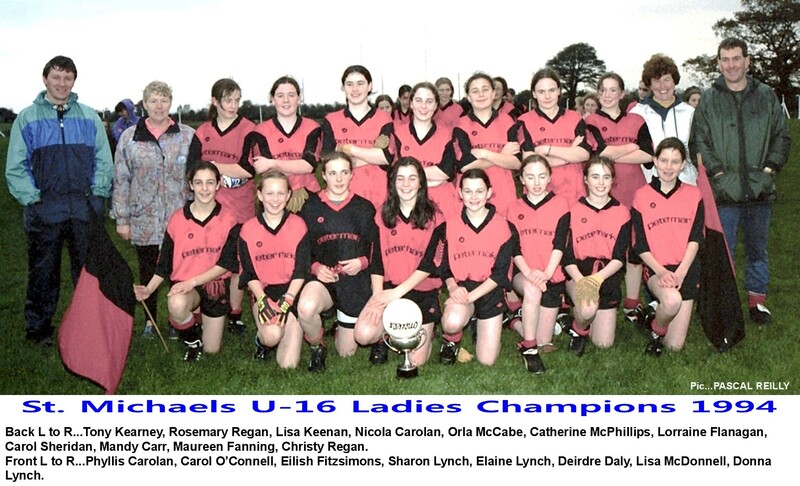 Injury time goals from Wendy Flood and sub Triona Doherty clinched victory and the 1997 minor football title for St Michael’s ladies. They overcame a gallant Dunsany side by a scoreline of 4-6 to 3-8 in September last at Kilberry. It all looked so different for the North Meath girls with time running out, losing by 3-8 to 2-4. But the Michaels knotched 2-2 in the remaining minutes to emerge victorious by a single point. Good performances for the winners came from Mary Costello, Lisa Keenan and Wendy Flood. Sylvia Carolan, Lisa Lynch, Carol Sheridan, Donna Lynch, Mandy Carr, Elaine Lynch, Deirdre Daly, Mary Costello, Sharon Lynch, Susan Carpenter, Lisa Keenan, Ailish Fitzsimons, Sharon Mooney, Wendy Flood, A. Carolan. Triona Doherty for Fitzsimons, Nicola Carolan for Mooney. St. Michaels 4-16, Dunsany 4-5. Sunday September 28th 1997 in Martry. St. Michaels recovered from a 0-6 to 2-5 interval deficit to defeat Dunsany in the girls U-16 final at Martry as Carol O’Connell starred in attack. Ashling Cleary was outstanding for Dunsany and she was well supported by captain Jenny Cusack and Tracey Clarke. Donna Lynch, Lisa Lynch, Carol Sheridan, Deirdre Daly, Elaine Lynch Mandy Carr, Triona Doherty, Mary Costello 0-2, Lisa Keenan 1-2, Ailish Fitzsimons, Carol O’Connell 2-6, Lisa McDonnell 0-1, Aisleen Regan 1-3, Joanne Kangley. Fiona Costello 0-2. A. Cottrell, M. O’Brien, C. O’Connell, M. Doran, T. Clarke, D. Dixon, M. Lynch, A. Donnelly, F. Lynch, J. Cusack 0-3, S. Coleman 0-1, A. McGowan 2-0, A. Lynch, A. Cleary 2-1, A. Guy. R. Dennehy for O’Brien, G. Tyrell for N. Lynch, P. O’Brien for A. Lynch. St. Michaels 1-12 Kilmainhamwood 0-11. Half time St. Michaels 1-5, Kilmainhamwood 0-4. St. Michaels enjoyed a rare visit to the winners enclosure when the club’s underage players turned on the style in the under 16 FL decider at Kilberry. St. Michaels made a blistering start which yielded 1-5 and enabled them to survive the challenge of Kilmainhamwood in an exciting tussle. Andrew Rogers fired his sides first goal following some good play from Peter Clinton and that strike gave them the initiative. Kilmainhamwood rallied but they were held at bay by a strong St. Michaels defense which was superbly marshalled by Derek Flood. The Wood eventually got going late in the first half and four points in quick succession brought them back into contention as they trailed 0-4 to 1-5 at the break. After the resumption St. Michaels stretched that lead with scores from Andrew Rogers and Peter Clinton while Kilmainhamwood replied with a point. John Barry O’Reilly and Ben Farrell stretched the lead further before Kilmainhamwood hit a purple patch and fired six unanswered points which reduced the margin to the minimum. That one point was as close as the WOOD could get as St. Michaels found another gear near the end and two points from Ben Farrell and J.B. O’Reilly ensured something to smile about for the St. Michaels club this season. Shane Prunty for Christopher Monaghan. John Hand, Ciaran Lynch, Mark Maguire, Felim O’Reilly & Raymond McEntee. It was not all doom and gloom in St Michaels during 2000. 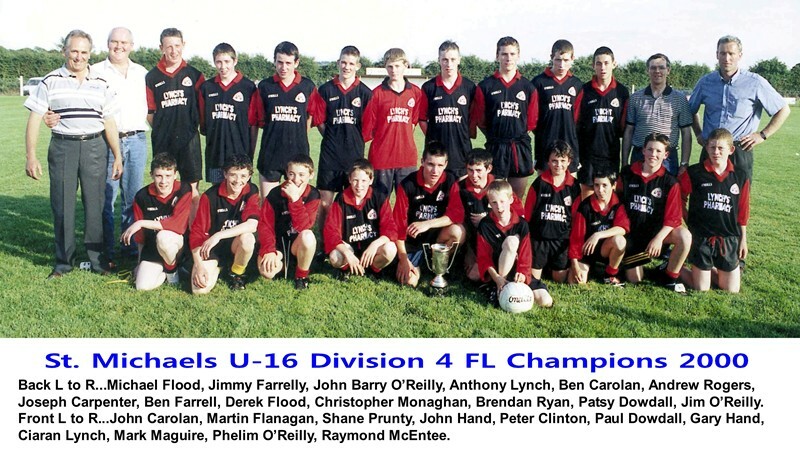 Okay, so junior football in 2001 may not appeal to a club with such a proud tradition but the performances of their U-16’s in capturing the Division 4 crown suggests that more adult success may be just around the corner. Royal County talks to Juvenile chairman Jimmy Farrelly who was also a selector with the victorious team. 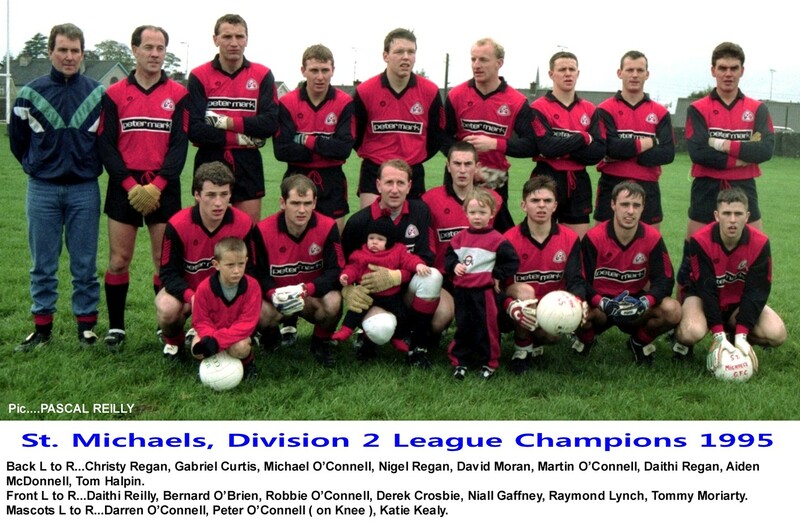 The officials, players and supporters of St Michaels won’t recall the year 2000 with much fondness in the years to come. The club’s adult players endured a disappointing year which concluded with relegation to the junior grade. In contrast, the club’s U-16’s could do no wrong as they annexed the Division 4 title at the expense of north Meath neighbours Kilmainhamwood. The Castletown scoreboard read 1-12 to 0-11 at the end of an absorbing encounter. Former St Michaels player, Jimmy Farrelly, who’s also the chairman of the club’s juvenile section was a selector with the victorious team along with Patsy Dowdall, Michael Flood and Jim O’Reilly and, needless to say, was delighted with the team’s performances throughout the year. St Michaels qualified for the final against Kilmainhamwood thanks to a semi-final victory over Moynalvey and the Carlanstown/Kilbeg outfit had four points to spare over their north Meath opponents at the end of an exciting sixty minutes at Castletown. Jimmy and his fellow selectors couldn’t have asked for a better start as their charges raced into a 1-5 to 0-0 lead, the goal arriving courtesy of Andrew Rogers ten minutes into the game. But, Kilmainhamwood, to their credit, fought back, and the half-time score read 1-5 to 0-4. Michaels resumed with points from Rogers and Peter Clinton while their opponents replied with a point before John Barry O’Reilly and Ben Farrell extended their team’s advantage. There was some nervy moments near the end, however, for supporters of St Michaels as Kilmainhamwood rattled off six points on the trot to reduce the deficit to the minimum. But points from Farrell (two) and O’Reilly steadied the boat and the Michaels held on to secure a thoroughly deserved success. Brendan Ryan, Derek Flood, O’Reilly, Clinton, Rogers and Farrell were the winner’s most impressive performers on the day. “Like all local derbies it was a very tough game,” recalled Jimmy. “We were lucky in that we got a great start and Kilmainhamwood were playing catch-up for the rest of the game. The St Michaels U-12’s narrowly missed out on similar success when losing their championship decider to Drumconrath/Meath Hill by the narrowest of margins. Ambrose, Oliver and Pete Cassidy and Bernard Lynch were involved with that team. Jimmy reveals that we’re bound to hear more about a number of these players. The U-12’s and the U-16’s were the highlights of another disappointing year for the Carlanstown club. As recently as 1998, St Michaels were performing in the top flight of Royal County football but things haven’t gone right for them since and the junior grade now beckons since they suffered relegation from Intermediate this year. It is for this reason, according to Jimmy, that a juvenile section was established within the club for the first time at the beginning of 2000. Incidentally, Ronan Curran is the fledgling committee’s secretary. “It was decided at the start of the year that an extraordinary effort has to be invested into the underage within the club and it was for this reason that an underage committee was set-up. We want to try and put a structure in place which will ensure we get the best out of all our young players. “Getting relegated from Intermediate was a major disappointment for the club but, in one sense, it may not do any harm in the long run. I say that because when you’re losing consistently people tend to get fed up and disinterested. The junior and intermediate championship medalist adds that no finger of blame for the Michael’s slide down the rankings can be pointed in the direction of the club’s executive committee. Luckily for St Michael’s, there’s no sign of Jimmy Farrelly’s interest waning either.